Touchstones Creative Writing Group is an independent creative writing group who meet monthly to encourage and promote creative writing. The positive benefits on an individual’s health and well being through expressing yourself through creative writing are immense. The aim of the Touchstones Creative Writing is to increase the positive perception and well-being of the individual and the community and offer an outlet of people who might otherwise be socially excluded. 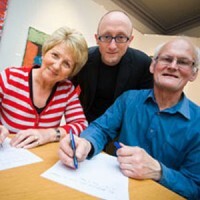 Our thriving creative writing group meets regularly in Rochdale to listen, write and publish our own work as well as collaborate extensively with other arts groups in Rochdale and the wider area. If you are looking to develop your writing skills or just spend time with a group of friendly, like minded people then please contact us – we are always looking to welcome new members.